President Rodrigo Duterte on Tuesday urged Filipinos to remain steadfast in upholding the country’s sovereignty, as about 1,000 protesters descended on the Chinese Embassy in Manila to oppose the Asian superpower’s presence in the disputed South China Sea. In his message to honor the 77th commemoration of Araw ng Kagitingan (Day of Valor), the President, hailed the heroism of Filipino and American soldiers who fought side by side during World War II. “Today, we remember the heroism of the brave Filipino and American soldiers who stood side by side in the mountains and jungles of Bataan in defense of our liberty and democracy,” Duterte said from Jolo, Sulu. “As we hold this solemn observance, it is my hope that we will all be inspired to remain steadfast like our forefathers and their allies in upholding our sovereignty and in protecting rights and freedoms that our people enjoy today,” Duterte added. At the Chinese Embassy, flag-waving marchers chanted “China out” and brandished a banner saying “Defend our sovereign rights,” referring to Beijing’s expansive claims to the resource-rich waterway. “The government headed by President Duterte is not responding. 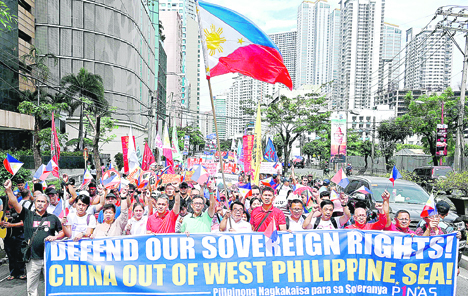 What China is doing is almost an invasion,” marcher Alex Legaspi, a 53-year-old teacher, said. While President Duterte has largely set aside the once-heated territorial standoff over the sea, tensions have flared since hundreds of Chinese vessels appeared recently near the Manila-held Pag-asa (Thitu) island. Duterte has been criticized at home as being too eager to grow ties with Beijing and giving up too much leverage on the South China Sea issue. “We cannot allow... China to control Filipinos and the Philippines’ sovereignty,” Wilma Quierrez, 53, member of the indigenous rights group, said. “The loan agreement signed by [Chinese President] Xi Jinping and President Duterte will send us into debt trap,” she added. “We may not be able to memorialize all of them, but we will forever remember and honor their epic struggle and unshakeable fortitude,” he added. In a separate statement, Presidential Spokesman Salvador Panelo echoed the President in honoring the fallen soldiers and surviving members of the Bataan Death March. “These Filipino fighters demonstrated the highest form of love of country when they offered their lives in the liberation of the Philippines during World War II. Thousands perished from physical abuse, exhaustion, disease, and starvation during this dark chapter of our history so that we, the future generations, may live to enjoy the blessings of peace and freedom,” he said. The Palace official said “heroism” in modern times does not only refer to valor in combat or physical courage. Nowadays, modern-day Filipino heroes range from Filipino scientists, devoted teachers, corruption-free government workers, and police officers who lose their lives in the war against illegal drugs. “Indeed, the modern-day Filipino hero of today can be anyone who serves as an inspiration by going above and beyond their call of duty and whose positive influence is worthy of emulation in making a difference in our society,” he said. Panelo also appealed to the people to set aside differences and throw out partisan politics in the name of unity. Vice President Leni Robredo, meanwhile, said she hopes Filipinos will strive to be as brave as their forefathers who fought colonizers and abusive regimes. Robredo issued the statement as she led the commemoration rite of the 77th Araw ng Kagitingan or Day of Valor in Bataan. MEMORIALIZING A MEMORY. 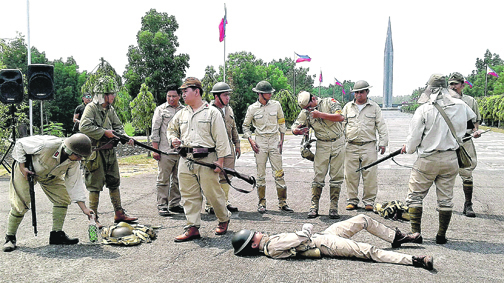 While actors and volunteers replicate Filipino and Japanese troops during the infamous Death March in April 1942 following the surrender of Allied troops—76,000 Filipino and American soldiers—to the troops of Tomoyuki Yamashita in front of the Capas National Shrine in Tarlac, 106 kilometers north of Manila, west of the MacArthur Highway. “In our history, the Filipino has always stood up for the country—whether it be against invaders or abusive regimes. The Philippines is the cradle of the valiant, and we must live up to that every day. Long live the bravery of Filipinos!” she said in Filipino.